All Generations Home Care has re-defined home care. Now, home care is not limited to only personal care and assistance, we also provide services for all generations adding a large selection of customized home care services. Each client is assigned their personal manager to oversee all assigned services. We provide reliable, trained and experienced service providers. We are committed to providing every client with quality services. 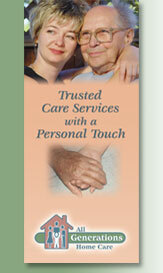 Our national Advisory Board is unique to Home Care service agencies. Input from the Board keeps AGHC on top of best care practices.